January 22, 2019 — Today the U.S. Supreme Court issued an order allowing the Trump administration’s transgender military ban to go into effect temporarily while challenges to the policy continue in federal courts. “The Supreme Court’s decision to allow the Trump administration’s cruel transgender military ban to go into effect is a slap in the face to both brave service members currently serving our country and those who want to serve. Enforcement of the ban means transgender service members will face cruel discharges. 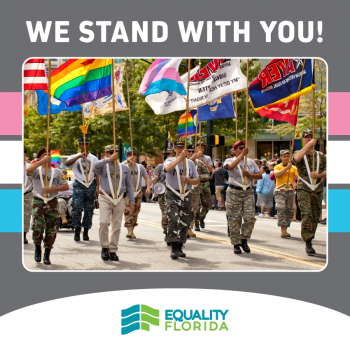 Transgender recruits will be denied enlistment opportunities while these cases proceed and transgender Floridians will wait in limbo until the Court has another opportunity to consider the case on the merits.